When the going gets tough (ecopsychologically speaking) take a turn to natural beauty. 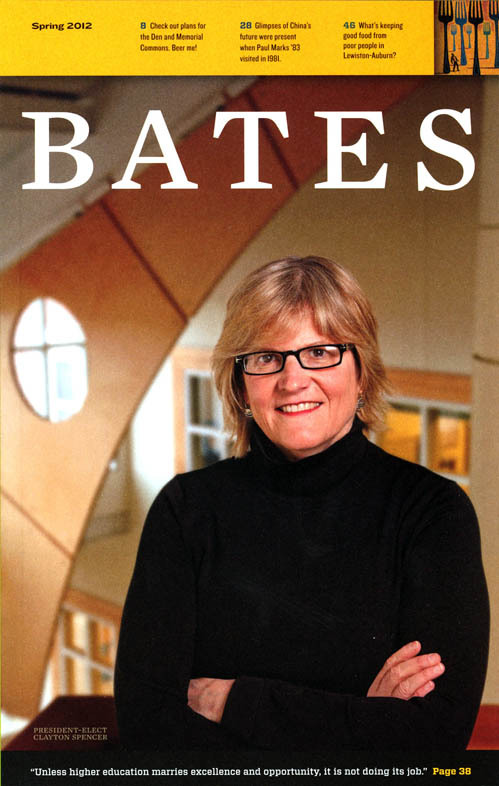 Introducing the eighth president of Bates College, A. Clayton Spencer. Saying goodbye to the Rev. Peter Gomes ’65. Alumni involved in worker rights discuss the national salmonella outbreak, traced to a notorious Maine egg farm. Alums involved in drug development explain the challenges and criticisms of their industry. A day in the life of Joanie Meharry ’07, an American scholar working in Kabul, Afghanistan. Young Americans like Maggie Merrill ’98 find compelling opportunities in New Orleans. Army physician Dave Lounsbury ’72, a veteran of Iraq, brings the war home. Joshua Holdeman ’93, international director of 20th-century art for Christie’s auction house, is all ears (and phones) as he talks to clients during bidding. Nicolas Lindholm ’86 displays tomatoes grown on his family-operated organic farm. He’s among the alumni who produce food in Maine, profiled as part of the College’s “Bates Contemplates Food” initiative. 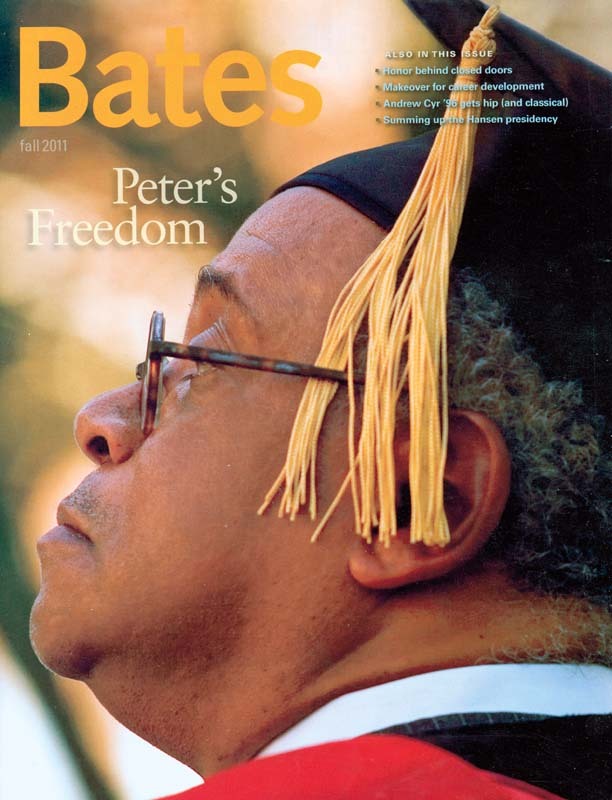 Spelman and Morehouse colleges offer Bates students something that their own college can’t — and that’s just the point. His senior thesis project launched Lee Lynd ’79 on a quest to turn common plant materials into inexpensive, sustainable ethanol. Timing and talent have shaped the career of actor John Shea ’70. Rebecca and John Corrie live their commitment to Bates, their disciplines, and their students. Far from being just an optimistic spin on life, stories of redemption — like those emerging after 9/11 — sit at the very intersection of self and American society. Spring has sprung, cold gusts are kicking up grit, and novelist Elizabeth Strout ’77 poses for the camera on a street in Portland, where she was born. Dining Services dishes up 4,000 meals a day and caters another 5,000 events annually despite funhouse wayfinding, comical space limitations and less-funny workplace challenges. As devastating as it was, Martha’s diagnosis of autism was not a shock. Seemingly typical in many ways, Martha gave us clues that something was awry. History professors Steve Hochstadt and Elizabeth Tobin joined their students in an exploration of Berlin and then asked them to pick out a place to investigate. Lena Sene ’00, Eduardo Crespo ’04 and Melissa Wilcox ’03 talk about their chosen paths from College Street to Wall Street. 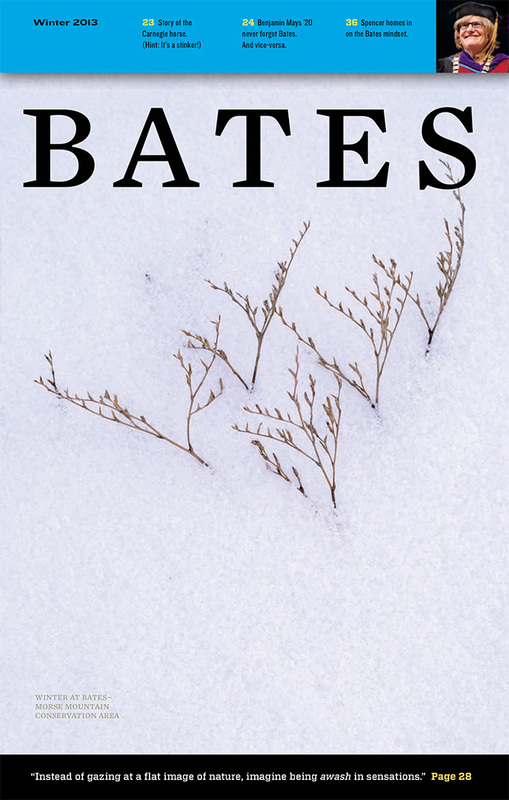 In a micro sense, their experiences point to a change at Bates. In the world of Hollywood animation, Norton Virgien ’74 and Charles Grosvenor ’74 draw on Bates friendship. Working next door to one another, but painting in styles a chasm apart, two art seniors put “joyousness to the wall” in Olin Arts Center. The range of human experience is on the syllabus for CBB students living and studying in Quito, Ecuador. A questioning perspicacity gives Elaine Tuttle Hansen an eye for ripening opportunities. “I like to think I’ve been able ‘to maken vertu of necessitee,'” she says, borrowing a phrase from Chaucer. President Don Harward demanded great things from Bates, and the College rose to the challenge. Lesley Boakye-Danquah ’03 shared a gift with the Bates community at last year’s international fair, wearing a beloved handmade dress in the red, yellow, and green colors of the Ghanaian flag. Bravery has twice allowed Dan Stockwell ’64 to save lives while risking death. Compassion has kept him from talking about it. Turning his senior thesis into an acclaimed children’s book took a leap of faith for Red Sox fan Matt Tavares ’97.